Rep. Peter DeFazio (D-OR) this week introduced legislation to implement a small tax on transactions of stocks, bonds and derivatives to discourage the same speculative financial trading that led to the 2008 Wall Street collapse. According to the Joint Committee for Taxation, the tax would raise $417 billion over ten years, which could be used to fund national priorities like free higher education or job-creating infrastructure repair. At a news conference on Capitol Hill, CWA President Chris Shelton and leaders of financial reform groups joined De Fazio and applauded the legislation. 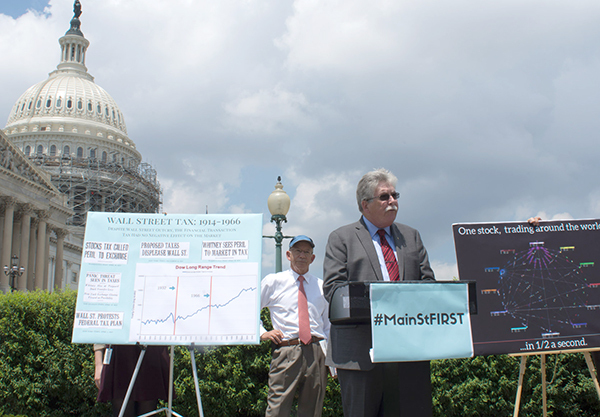 "We're proud to join with Congressman DeFazio in putting working families and Main Street first by setting a small fee on the billions of dollars of Wall Street trade that happens every day. Not only would this raise more than $400 billion to help families and communities, but it would also put the brakes on risky Wall Street behavior that threatens our economy," said Shelton. "Thanks to the reckless greed of Wall Street over the past few decades, the American economy is a grossly unbalanced playing field," said Rep. DeFazio. "The only way we can level it is if we rein in reckless speculative financial trading and curb near-instantaneous high-volume trades that create instability in the stock market and our national economy. These financial practices have no intrinsic value, and exist to make a quick buck for already-wealthy speculators. If we want to give middle-class families a fair shot at a strong economy that works for all Americans, we need to put Main Street first." The legislation is supported by CWA, the AFL-CIO, Americans for Financial Reform, the Center for Economic and Policy Research, and Public Citizen. Learn more about the Take On Wall Street Coalition here. CWA President Chris Shelton and leaders of financial reform groups joined Rep. De Fazio at a news conference on Capitol Hill to stand in support of his Wall Street Speculation Tax legislation.